Recently, we noticed an interesting error in our production system. Following are the steps we took to uncover the details of this error entry. Error: 17836, Severity: 20, State: 17. First we need to figure out where is this database connection request coming from. Use DNS look up (nslookup a.b.c.d) command to identify the machine that is sending this connection. Similarly, use Network command netstat -anp to uncover all the connections coming into the database server; Then filter them down to this particular IP (a.b.c.d) and see what port are they originating from. Now go to that remote machine and run similar netstat -anp command on it. Now, compare and confirm that the PID for this process. With the above two steps, you could find out exactly what software in that remote machine is trying to connect to the database server. Now that you have the exact PID (ProcessID) on the remote machine, go to Task Manager and check under Processes tab to see the originating software name. See if using Sql Authentication could help in allowing that remote machine to connect successfully (if its a valid login request). There are some other unconventional approaches to digging in further, but the above steps should be sufficient in troubleshooting. Sql Server Error Message: spid x I/O is frozen on database xxxx. No user action is required. However, if I/O is not resumed promptly, you could cancel the backup. Rarely, but every once in a while, we see this entry in our production virtual database servers. Initially it seems benign, but upon further investigation we learnt that this is a repeating issue and there is an explanation for it. The same message could appear for all databases on this drive. 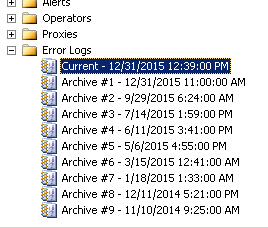 In short, this occurs when VSS backups are made through VDI. Sql Server has a lot of APIs that enable independent software vendors to integrate Sql Server into their own products. Through these APIs, they carry out necessary functionality while maintaining the reliability, feature-functionality and performance of Sql Server. One such API interface is VDI (Virtual Device Interface); This works from within the VSS (Volume Shadow copy Service), through which 3rd party tools could perform backup & restore operations through BACKUPs using SNAPSHOT. Using the VDI interface, when such command (BACKUP WITH SNAPSHOT) is executed, Sql Server needs to make sure that the backups are reliable and complete. Since data files are under constant lock by Sql Server with continuous updates going on, Sql Server has to temporarily cease all I/O into the data files to secure a volume snapshot. Once that is complete, the same 3rd party tool tells Sql Server through VDI that I/O can now resume. This is usually for a short duration, but depending on the size of the file and the throughput of the drive, it could sometimes take longer. In our environment, we see I/O freeze for a few seconds. This is not good. 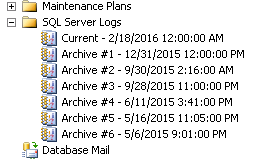 So we schedule these snapshot backups during daily scheduled down times. 2016-02-19 18:36:36.37 spid125 I/O is frozen on database master. No user action is required. However, if I/O is not resumed promptly, you could cancel the backup. 2016-02-19 18:36:47.91 spid125 I/O was resumed on database master. No user action is required. Sql Server provides interesting tools to play with many great features is has. One such feature is CONSTRAINTS. You could add FOREIGN KEY, CHECK, PRIMARY KEY, UNIQUE KEY, NOT NULL, etc. Some of these could be disabled as needed without losing the CONSTRAINT definition on the table. In the above example, we create foreign key constraint between Parent & Child table on Parent_Id column in Child table referencing Parent_Id in Parent table. So any records entered into Child table, must comply with the rules of the constraint a.k.a. for every record INSERTed, internal checks are performed for validity of data integrity with the data model. The INSERT statement conflicted with the FOREIGN KEY constraint "FK_Child_Parent_Parent_ID". The conflict occurred in database "tempdb", table "dbo.Parent", column 'Parent_ID'. Sometimes, in lab environment, we want to disable such constraints. There is an easier way to disable without DROPping them. The key word NOCHECK tells Sql Server not to check for compliance, while still keeping the constraint definition in catalog. When the constraint is disabled, any records entered into Child table are not checked for compliance with the constraint. So, INSERTing un-compliant data will still be successful. Now to enable it, we use the following command. If you want to disable or enable all constraint on the table at the same time, use the commands below. The key word, NOCHECK could be used in two ways. The other is in constraint definition. If you use NOCHECK during constraint definition, it tells Sql Server to enforce the constraint going forward, but not for existing records. So any data that does not comply with the new constraint are not checked, but any new records are checked for compliance. This is really interesting nuance. Sometimes when working on some issues, it becomes necessary to review error message entries in Sql Server Error Log file. On occassions, when there are too many entries and it becomes necessary to find patterns. Manually finding patterns is tedious.